Orpington Church was apparently one of the first churches in England to possess an organ. According to two separate sources, the Canterbury Archive, and the British Organ Archive, an organ existed at Orpington as early as the first part of the fourteenth century. The Rector later removed it to the Rectory “for the entertainment of his friends,” and, as a result, was summoned to the Consistory Court at Canterbury. In the eighteenth century there was a small organ in the West Gallery in which the (paid) choir sat. According to The Story of Orpington (The Reverend Francis Chenevix-Trench, 1894) “during the singing, the congregation turned round and faced the gallery.” The gallery and the organ were removed in the extensive restoration of 1840. As part of the 1840 restoration, J.W.Walker & Son built a single manual organ in the chancel, and later, in the same century, Alfred Kirkland of Holloway added Swell and Pedal organs. In the late nineteenth century, Walker & Son made some more additions and substituted an “English” [sic] Pedal board. In 1958, when the modern extension to the church was built, Bishop & Sons removed the organ to its present position in the New Church, electrified the action, and made further additions. 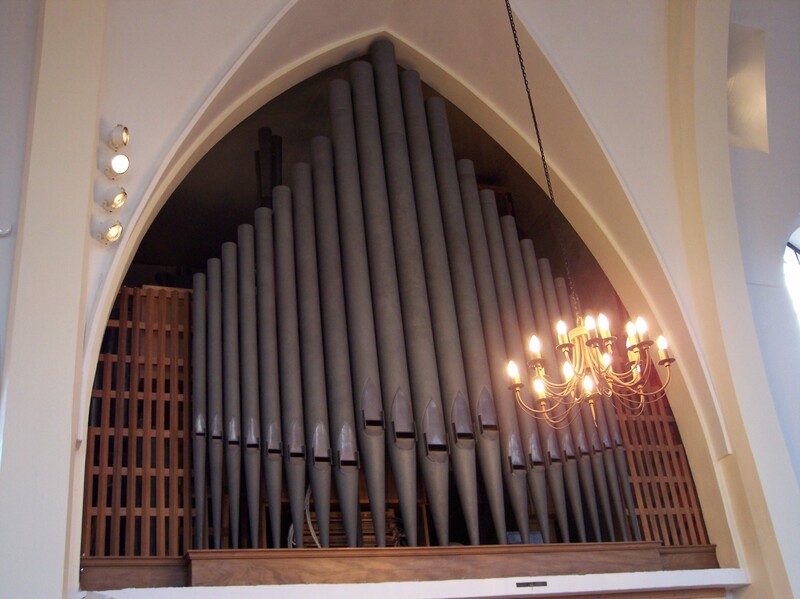 A single manual organ, built by James Turrell of the “Model Organ Works”, in Greenhithe, Kent, around 1900, was purchased, and installed in the chancel of the Old Church where it remains today. In April 1997 the organ builders, Martin K. Cross, in consultation with Raymond Lewis, completed a major rebuild of the main organ which included repairing warped soundboards, and a thorough overhaul of the action, new solenoids, new keyboards, new pistons and an eight channel “capture” action, and new Pedal contacts. The Swell box was enlarged to accommodate a two-rank Mixture, a Celeste (new pipes), and the conversion of the 8’ Oboe to 16’ pitch. The former Great Twelfth is now a Nineteenth (new pipes). A Fifteenth (derived from the Open Diapason No. 2), and a Quint (from the Bourdon) were added to the Pedal, and a Trumpet/Trombone unit was added to the Pedal and Great departments. Specification of the Organ following the rebuild by Martin Cross in 1997 and modifications in 2013. 8 Channel Capture Action system. Setter piston, General Cancel, Balanced Swell Pedal.